My daughter and I experienced the longest goodbye during my husband’s decade-long struggle with Alzheimer’s dementia. Henry died in March of this year. Henry taught me to play bridge more than 30 years ago when we were courting. My daughter, as a little girl, learned how to play the game while sitting on his knee. Playing bridge became a tradition with my family as we played weekly with friends, and whenever we went to California to visit Henry’s mother (also a very fine bridge player). All day today, people across the country are doing the things they love as part of The Longest Day, an Alzheimer’s Association event to raise funds and awareness. Some will participate by hiking, cycling, swimming, sailing, bowling, dancing, painting, running, skateboarding or rock climbing. We are playing bridge. The Longest Day gives my daughter Kristen and me a chance to honor his memory in a very tangible way. I am very grateful that Donna Compton, the owner of our bridge club in Dallas, chose to participate in this very special day. Henry was a brilliant scientist, unfailingly kind and interested in making a difference in the world and in people’s lives. He was diagnosed with posterior cortical atrophy, a variant of Alzheimer’s, in 2006; but continued working until May of 2009, when he retired after 31 years with the United States Environmental Protection Agency—determined to continue living according to his goals instead of giving in to depression or desperation. He and my daughter stayed active in the community, especially with the YMCA for which they both raised thousands of dollars each year during the Y’s scholarship fund drive. Before he passed away, Henry made the decision to donate his body to the University of Texas Southwestern Medical Center Memory Research Unit. Until the very end, he was committed to doing what he could to make a difference. Participating in The Longest Day allows me to be part of a movement and most importantly, carry on my husband’s legacy for the study and eventual eradication of this dreadful disease. My involvement in this event has given me a new perspective on everything we’ve gone through over the last few years. As I play bridge, I will reflect upon the truly blessed life we had and the nobility with which my dear husband faced his inevitable decline. I feel as if I owe my service to Henry, to my community and to all of those suffering with Alzheimer’s disease as well as their loved ones. Seeing our community and others come together shows me that this disease affects everyone in some way. Sharing our stories, journeys and supporting one another has been an incredible experience. I can only hope that what we do today, in this unified effort, will truly have a lasting impact for the Alzheimer’s Association and the fight to find a cure for this devastating disease. About the Blog Author: Laura Onsgard lives in Dallas, Texas. She is participating in Alzheimer’s Association The Longest Day®, a sunrise-to-sunset event to raise funds and awareness for Alzheimer’s care, support and research. Thank you for all you do and for sharing memories about your husband. I wish we had a cure now but am hopeful there will be one in my lifetime. It is a horrible disease in so many ways. For those taking care of someone effected, we have to say good bye more than once and it’s so unfair. Registration opened March 18 at local bridge clubs across North America and it’s not too late to sign up! Visit http://www.alz.org/thelongestday for more information and a club near you. Henry sounds like a WONDERFUL man and it's very commendable of you to remember him in this manner. Hello! I am Margaret D. and I was very touched by your story. I am sorry for the loss of your husband. I live in the Plano, TX area and I am participating in "The Longest Day" for the first time this June 21 as a Team Leader. My mother, Mary, was diagnosed with AD in 2011. She has slowly declined over the past few years. We have always been very close. Over the years we spent a lot of time together – getting together for lunch, family barbecues, holidays, shopping, vacations, etc. I am the oldest daughter and designated power of attorney, and now our roles have reversed. I never dreamed even 10 years ago, that we would be going down this road. This has been a road with no road map. My mother has gone from her home of 50 plus years, to independent living, then assisted living, and now a skilled nursing home due to some other health concerns that cropped up recently. My church is Custer Road United Methodist Church in Plano. We have "Treasured Times" as a ministry to our community that is staffed by volunteers. For 4 hours a week, people with AD can come and have an enjoyable day and their caregivers can receive some much needed time to themselves. I have been busy working and trying to manage all of my mother's affairs over the past few years, but in the near future, I plan to volunteer to this group. For now, "The Longest Day" is the least I can do to push for a cure for this disease. 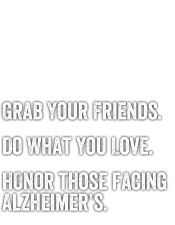 I know that I do not have the money or resources to make a big impact, but with the Alzheimer's Association, we can make a difference one person at a time.